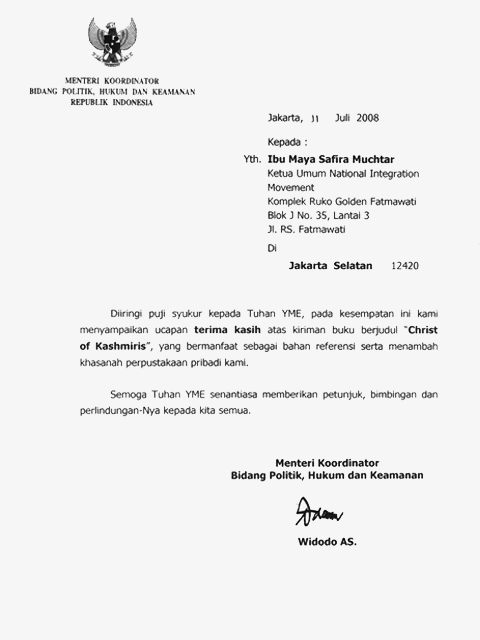 Herewith we would like to inform you that your letter number NIM/VII/2008 dated 7 July 2008 and the attached book titled “Christ of Kashmiris” published by the Anand Ashram Foundation and Anand Krishna Global Co-operation, both delivered to the President of the Republic of Indonesia, have arrived safely. We have delivered the book and letter to Mr. President, via his Personal Secretary. On behalf of the President, we would like to express our gratitude upon your gift. This “must read” book is the most provocative book ever. It does not dwell on the “pros and cons” regarding the historicity of Jesus, rather on the relevance of Jesus’ teachings in modern times. It based on the author’s own experiences discussing some secrets not only about Jesus but also Muhammad, Adam, Khidr, Jhulelal, the Mahabarata war, the 9/11 tragedy and the Bali Bombing. Interestingly, the author talks about the root of terrorisms and offers the solution. He believes that “love is the only solution”. He also shares his experiences with love in this running commentary book. The book is very subjective. It begins with the acknowledgement of Jesus divinity, Who is known as Saint or Prophet Isa by the Tibetans and the Sufis, and as Sage Yuzu Asaph by the Kashmiris. The Jesus you will meet in this book is not the one who died and then resurrected, but the Ever Living and Ever Loving One. The One Who talks about the power within. The first chapter is mostly related to the author’s experiences during traveling to India. The story starts with the trip to Kashmir when he visited the tomb of Yuzu Asaph at Rozabal (located in the old part of the city of Srinagar). The people of Kashmir believe that the Sage Yuzu Asaph is Jesus. In this book, the author also cited some documents concluding that the Sage Yuzu Asaph is Isa of the Muslims and Jesus of the Christians. Some of them were quoted from a book entitled “A Search for the Historical Jesus” written by Professor Fida Hassnain, once the Director of Archeology in the State of Jammu and Kashmir, who wrote the introduction of this book. Besides, the author also shares his experiences while he was inside the building of the Holy Tomb where he felt such a realm and saw a group of people planning to kidnap him. The author also tells us how he was saved. Other places such as the Mosque of Hazratbal where “The Sacred Hair” of Prophet Muhammad was placed and also the holy city of Rishikesh brought about such experiences for the author to be shared in this book. You can also find how music, songs, art and culture become the power to save a country against violence. The second chapter provides some information about the cultural root of several civilizations and also many secrets about the root of terrorisms and violence, starting from the Mahabaratha war. The book provides some evidences that Mahabarata war was not just a legend, a myth, but a nuclear war. Interestingly, the information is now confirmed by the researchers and archeologist. We can also find out who Prophet Adam and Khidr are and what their connection with the Mahabarata war is. In this chapter the story about young Jesus, Mary Magdalene and St. Thomas was discussed as well. Praise the Almighty, we would like to thank you for the “Christ of Kashmiris” you sent us earlier, which is very useful for our reference and private library. May God the Almighty lead and protect us. The launching book of Christ of Kashmiris in Jakarta was held at Bondies Café, 135 Ampera Raya, Jakarta, on July 9 2008. The event was attended by approx. 100 guests from Anand Krishna book’s readers and was hosted by a Pesona FM radio broadcaster Wisnu Prayuda. In the opening speech, Anand Krishna talked about the difference between Science and Spirituality. Science was something that didn’t have to be re-formulated or re-invented. It could just be used and developed. Meanwhile, Spirituality had to be experienced by every person because it was a private journey within. So, in spirituality, the stories would be always different, but the essence of the stories was the same. Some people would called their experience as Nur Muhammad (Nur=Light), Christ Consciousness or Avatara. In 1990, based on his deep and comprehensive researchs, Prof. Fida Hassnain concluded that the Rozabal tomb, located in downtown Srinagar-Kashmir, was the tomb of Prophet Isa Masiha who the local people called him as Yuzu Asaph. The Christian knew Him by the name of Jesus Christ. In fact, we could find a lot of Jesus Christ’s legacy here, such as places with name of Him, a local stories about Him, etc. Anand Krishna and some friends had visited the Rozabal twice this year alone to experience themselves the presence of Christ’s energy in Rozabal’s atmosphere. According to Anand Krishna, spiritual vision of Jesus was not dying on cross and resurrecting in the next three day to salvage human’s sins, as stated by church’s dogma. The highest spiritual teaching of Christ was Love your God with all your heart, soul and mind, and Love your thy neighbor as yourself. These commandments were actually about Consciousness. A lot of interpretations stated that Jesus had done His job of redeeming our sins and by believing just Him alone already meaning salvation. No, His job wasn’t done yet until we, ourselves, were willing to undertake our own cross. Prophet Muhammad ever said almost the same things that every part of our body would be asked to be accountable for every action taken. In Islam, there was a term of Mi’raj which means self-realization or quantum leap. By ‘riding’ our own consciousness (symbolized in Islam as female horse), in our nakedness, we had to realize our selves and reached the highest state of our consciousness. An Indonesian famous brain and neural surgeon, B. Setiawan Sp.B., Sp.B.S shared his opinion anticipating enthusiastic questions and comments from guests about Jesus’s Tomb in Kashmir that had thrilled every visitor visiting this site. He explained that every person vibrating in his own pattern of energy or frequency. His body was only his tool. So, it was not important whether the tomb were the real tomb of Jesus Christ because if a person were vibrating in the same frequency or pattern of energy of a prophet, he would be able to feel the presence of the prophet. To reach this level of frequency or energy’s pattern, the body had to be used. Anand Krishna added that in fact when we had reached the higher level of consciousness, we would have many difficulties to interact with others from different level of consciousness. That’s why at this point, we needed a support group consisting of our fellows vibrating in the same level of our consciousness. The solid support group would leap our consciousness to the higher level. That’s why such support group was very important to help us in continue our spiritual journey within, the journey from lesser to higher Truth. A lot of questions arised. One of them was whether there were disciples of Jesus following Him to India or Kashmir. Anand Krishna answered that there was in fact a document stating that at least one of them had been following Him, i.e., St. Thomas who later died in South India. Another question was why many Kashmiris today could become extremists and torn their own homeland into a civil war disputes based on religion fanatics. According to Anand Krishna, a nature land of Kashmir that was so comforting had spoiled some Kashmiris to forget eroding their ego. Then, they became religion fanatics who possessed a high level of ego, and they didn’t realize that. If this human ego were never been eroded by purposes, then the ego would cause many problems because every human ego inherited animal instincts from previous lifes, such as greedy, jeaolusy, etc. Prophet Muhammad ever said that the greatest jihad was to fight our own desire and lust. Maybe this world always needed a ‘garbage can.’ Like Palestine, there were a lot of turmoils in Kashmir that becoming a place of many orthodoxies, although there were also a lot of sacred religious places. That’s why in Tibet, there was a tradition to recyling energy, called Tonglen. Humankind could always change his own energy’s pattern. Because if we didn’t change it, our spiritual journey would be stop at this moment. World history would tell us that a civilization could only be developed and expanded if the human opened themselves to teachings and cultures of others. Till this present time, many had misinterpretted own religion teachings because of the ego. They closed their heart to others. They thought that their faith to religion’s dogma/doctrine was high enough to put them on salvation. They forgot that they had to carry their own cross so that they would be care of other people and reached their own level of Christ Consciousness, i.e, Love. And Love is the only solution. “My main purpose to write this book was about to actualizing Love and Compassionate in our own daily life, “ said Anand Krishna firmly, “I hope that all of us would be able to raise our voice whenever we saw injustice, unawareness, and ignorance in our life.” To live always within Love was the most important thing.